A Stringer model solution based on more than 30 years of experience with plasticity and design of reinforced concrete. 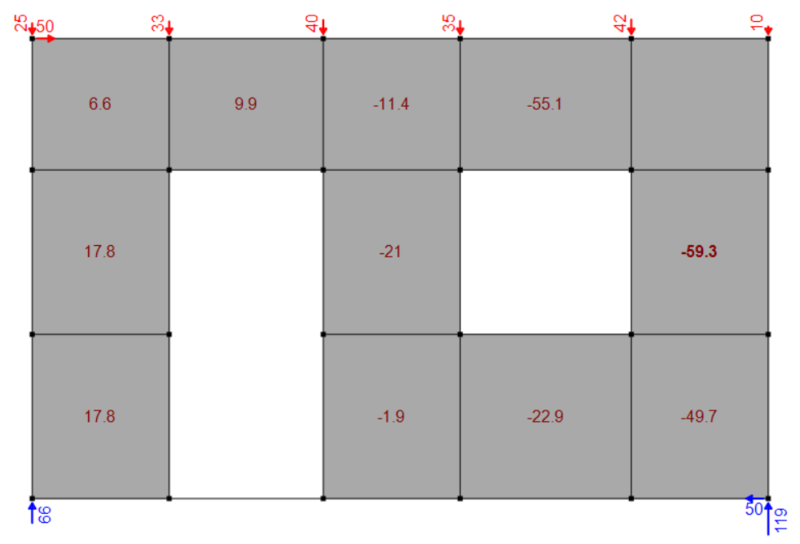 PolyStringer is a fast and easy way to design reinforced concrete shear walls and diaphragms. Stringer models have traditionally been solved by hand, however, this is very time consuming and often the solution is far from optimal. PolyStringer allows engineers to find the optimal solution within minutes. Stringer models are primarily used for reinforced concrete diaphragms and shear walls. However, design of steel structures sometimes applies for the use of stringer models as well. Using a stringer model, reinforced concrete diaphragms can be designed to withstand the shear forces associated with distributing the horizontal loads to the supporting shear walls. For design of stabilizing shear walls with openings, such as in the picture above, the stringer model is ideal for finding the optimal force distribution. Statically Indeterminate stringer models have multiple solutions. The optimal solution is the minimization of the required reinforcement. This solution is very true to the actual behavior of reinforced concrete and is easily found using PolyStringer. Are you ready for an Optimal Solution? Get your free student license, or try PolyStringer free for 30-Days. How to get started with PolyStringer? The first time PolyStringer is opened you will be asked to enter your name and e-mail. When is a stringer models used? A stringer model is an effective method for determining the required reinforcement for a concrete shear wall or diaphragm. This is especially used for designing multi-story precast concrete structures, where the stabilizing system is composed of shear walls and rigid diaphragm. In these structures the concrete diaphragm will often be required to distribute the forces to the shear walls and it is necessary to determine the corresponding reinforcement in the slab. PolyStringer uses a plastic solution which is an Ultimate limit analysis, the method can therefore in general not be used for serviceability limit state, however it has been shown that using the optimal plastic solution where the required reinforcement is minimized yield reasonable solutions for SLS as well. A stringer model can also be used for other materials which has a plastic material behavior. To do this correctly in PolyStringer the weight parameters most be adjusted accordingly. What is the basis of PolyStringer? PolyStringer is developed in cooperation between PolyStruc and NemStatik and is based on the NemStatik program StringerModel which is widely recognized in the industry. NemStatik is based on more than 30 years of experience with plasticity and design of reinforced concrete, and software such as ShearWalls and StringerModel. PolyStruc is a company working with software development of easy-to-use structural engineering software. The company is best known for the beam calculator, PolyBeam. Can the optimal plastic solution be used for design? Yes, concrete is a plastic material, and distributes the internal forces in the most advantageous way possible. The optimal plastic solution is therefore very true to the actual behavior of concrete and is recognized as a valid solution in the Danish national annex DS/EN 1992-1-1 DK NA:2013 5.6.1(3). Plastic solutions for reinforced concrete design is strongly founded in research and are widely used within the construction industry in Denmark. The plastic optimization of the stringer and shear forces lead to a solution, where the required reinforcement is minimized. This feature both reduce the overall cost of the concrete structures and is a more accurate description of the true behavior of concrete structures. PolyStringer has a graphical input area, that allow the user to alter data such as geometry, removal of stringer or shear fields directly. This combined with a speed optimized algorithm for solving the system offers a great user experience. When you have created and solved your stringer model it is very easy to document your work. Simply click on export, chose which content you want to include and let PolyStringer create a short and elegant PDF document for you. This feature is one of the most liked features among our users. See example. PolyStringer licenses are available both as single- and multi-user. Contact us and we will help you find the most suitable option for you. then click the button below and register for a free 30-days trial.